Tanner was promoted to the next level of Agility training recently. Last week when we attended the first class, well, let's just say I didn't exactly do him proud. To top that off, my daughter was home from college for Spring break. She came to watch and that turned out to be a disaster. Each time Tanner spotted the tables where she was sitting, he took off to investigate and give her a kiss. So much for focus. 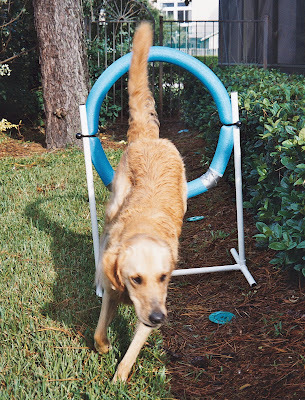 In agility training, focus on the handler is paramount. Well, almost. Having fun is even more important, and I suppose you could argue that Tanner had fun; therefore our primary goal was met. Clearly he enjoyed seeking out Toni for a check-in smooch, and he did eventually return to my side to complete the exercise. Hopefully, when Toni returns to university next week, Tanner will be more focused and we can make some small amount of progress. I really have no goal for being ready to go to competitions (they call them trials, I think). I'm trying to get into the FLOW and enjoy the journey. You could say Enjoy the Journey is my new motto. Having MS and being a cancer survivor, I have learned that goals are for those whose only enjoyment comes from accomplishments. Nowadays my enjoyment comes from learning new things, and experiences with friends and loved ones, including my dogs. I suppose there is some gray area there. After all, good experiences often lead to accomplishments. Being healthy and well is a good experience for me, so accomplishments, even running an Agility course properly, will eventually come. Perhaps when Tanner and Oliver are having as much fun as possible; that would be a well-earned accomplishment for both dog and handler. Tanner looks like he is having fun!